It would seem like celebrities are just like the rest of us, if the recent spate of star couple fights is anything to go by. From the recent Irina Shayk Bradley Cooper tiff at Wimbledon to Jennifer Lawrence and A�Nicholas Hoult, here are a few couples who had a A�public falling out. According to reports, Scream Queens star, Emma Roberts was having quite a troubled relationship with fiance Evan Peters. After being arrested for domestic violence, Roberts was spotted sobbing and screaming at Peters, even as he attempted to comfort her. A few weeks later, a video, in which Roberts is seen hitting Peters on the chest, started to make rounds. The two split up a few weeks later. The two, who split earlier this year, made quite an adorable couple and were seemingly in a happy relationship. However, it is speculated that the split was coming for quite some time. The two were reportedly photographed yelling at each other while on their way to the movies in Los Angeles, with the shouting turning into furious whispers as they neared the venue. was a tiny stand-off between Bradley Cooper and girlfriend Irina Shayk. In a video that went viral, it seemed like the Joy actor was telling offShayk, a Victoriaa��s Secret angel, even as she A�discretely wiped away tears. Sources close to the couple, later explained that she was tearing up due to allergies, but the Internet was not convinced. Jesy Nelson, of the British girl band, Little Mix got engaged to Jack Roche, the lead vocalist of the band, Rixton in July last year. The adorable couple was loved by fans for their talent, and also for how happy they looked. But late last year, there appeared to be some cracks in their relationship. During the launch of Little Mixa��s album, Nelson was spotted leaving the party in tears. She reportedly took a cab back home, while an upset looking Roche headed back to his hotel. However, a few hours later, the two, who are still together, posted a selfie assuring fans that all was well. JLaw is never one to care for what the public thinks of her, so it comes as no surprise that she thought nothing of having a shouting match with ex-boyfriend Nicholas Hoult at a restaurant a few months ago. 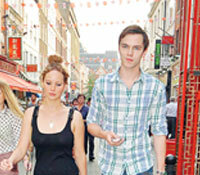 They two were having dinner at Nobu in San Diego, when Hoult said something that resulted in the actress erupting in anger. According to a source, a�?Jen was clearly upset with the topic of discussion. She threw her hands up in the air as she yelled at Nick who appeared agitated with her reaction. Next thing you know, he starts screaming too, it was quite a heated discussion before she finally walked out on him, leaving him to pay the bill.a�?